It was just announced that Yevgeny will be a nominee for the Tennis Hall of Fame, which just beat me to the punch, as he was next up in my Future Hall of Fame list. I can say that I did get it right with my previous post, as Guga Kuerten also was announced as a nominee, so we’re on a roll (sorta). 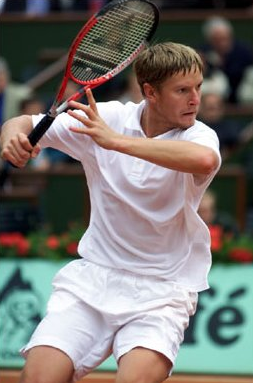 Russian tennis had never really had a superstar until Kafelnikov arrived. There had been the Andrei(s) Cherkasov and Cheskonov, who did a good job carrying Russian tennis for a while with moderate success, but what Yevgeny achieved was on another level. In 1996 he did what no one else has since achieved and that was winning the singles and doubles titles at the French Open. 1999 however was his career year, winning in Australia and becoming World number 1 briefly. He helped Russia win the Davis Cup in 2002 and crowned it all off with winning the 2000 Olympic Gold medal. After winning his fifth straight titles at the Kremlin Cup in Moscow, he donated his first prize of $137,000 to families of victims in a 2001 Russian plane crash in Black Sea, near his hometown of Sochi. An overlooked fact with Kafelnikov is what a successful doubles player he was. He won 4 Grand Slams, the French in 1996, 1997 and 2002 and US Open in 1997 with 2 Wimbledon semi-final runs. A total of 27 doubles titles and a ranking high of 4 in 1998, Yevgeny sure didn’t mind the workload nor money. What’s just as remarkable is that he had many doubles partners, with Daniel Vacek his most consistent. Yevgeny’s relentless schedule set the example for the likes of Davydenko and has drawn criticism from other players as a soldier of fortune, particularly Agassi in his day. Either way, it’s a job and he gave more respect to doubles that perhaps some of the top players do today? As much as he could seem dull on court, our Yevgeny certainly made up for it in retirement. 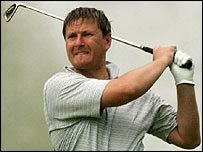 These days if he’s not found on the Poker table (he cashed three times at the 2005 World Series of Poker) he’s on the golf course and quite the golfer he is, recently winning the Russian National Championship. Either that says Russia is rubbish at golf, or the man can play. So much so, he wants to play Golf in the 2016 Olympics and be the first to play both sports there. He also briefly coached his heir apparent Marat Safin, continues to do some TV commentating on Russian TV and plays on the Champions Tour.